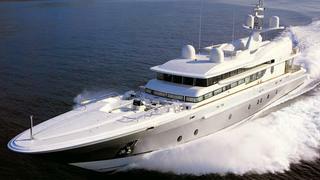 A call to James Greenwood at De Valk confirms that he's closed on the sale of the impressive 49m motor yacht Thunder B to a Croation buyer. Custom built by Oceanfast in 1998, Thunder B’s sleek exterior and understated yet sumptuous interior was completed to designs by the late Jon Bannenberg, with naval architecture by Phil Curran. She is fully compliant with MCA and DNV standards. Thunder B offers accommodation for up to ten guests in five suites, comprising two double and three twin cabins. The master stateroom is full beam and is complemented with a whirlpool bath and steam room. Thunder B was asking €5 million.